Hurricane Fausto is now at 85 mph and is moving northwest. It is about 450 miles south of Cabo San Lucas. 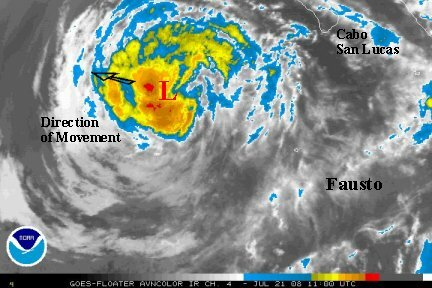 Fausto's main effects will be swell on the west coast of Mexico, expecially in the southern Baja. A few showers are possible too. Fausto poses little threat to Mexico. Forecast models take Fausto northwest, gradually toward cooler water. this should slowly weaken Fausto. 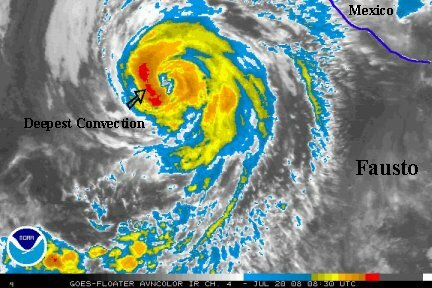 It's possible that in the short term some strengthening is possible, as noted by the deep convection burst near the center of circulation. Hurricane Fausto is still at 85 mph and is moving northwest. It is about 380 miles south-southwest of Cabo San Lucas. The temporary strengthening looks to have occured and Fausto looks to now really be about 85 mph. It looked a little weaker to us on the last update. The forecast models are steady and keep Fausto away from Baja as it slowly moves over cooler water. 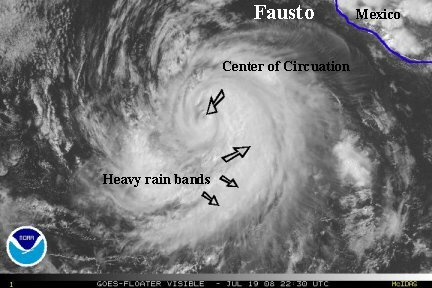 Fausto may still strengthen some before being impacted by the effects of cooler ocean water. The main effects to Mexico will be swell. Hurricane Fausto is still at 85 mph and is continues to move northwest. Satellite imagery from the last several hours show that Fausto's eyewall has expanded. Upper level divergence also is impressive with the noted cirrus banding. We agree with NHC that Fausto may be a bit stronger than the offical maximum sustained winds of 85 mph. 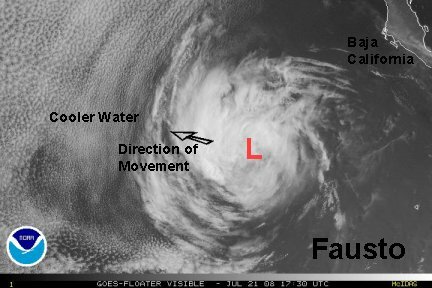 Fausto will move over colder water within 12-24 hours and should start the decrease in strength. Fausto will only effect Mexico with its sea swell. NHC increased Fausto's winds up to 100 mph per the 5 am edt advisory. Certainly, at that time Fausto looked very impressive. Fausto is now degenerating very rapidly. The eastern half of the eye wall has collapsed and top sustained winds are probably 80 mph. Winds take some time to "spin down" and don't lower quite a fast, even though 100 to 80 seems like a big jump. 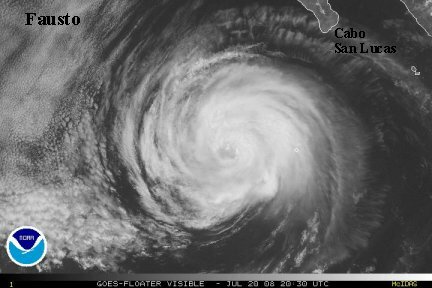 Fausto is a little over 400 miles southwest of Cabo San Lucas. The swell will continue to decrease as Fausto continues to weaken as it moves over colder water and farther away. NHC dropped Fausto on their last advisory to agree with our previous assessment.....top sustained winds 80 mph. Since then cloud tops have warmed and the eye is totally clouded over. It looks like the top winds are now closer to minimal hurricane strength or just below.....70-75 mph. Look for Fausto to drop to tropical storm strength soon and gradually weaken over the next few days over colder water. Fausto's top sustained winds were taken down to 70 mph on the last NHC advisory. Fausto will continue to weaken as it heads west well away fom Mexico toward cooler water. Fausto should become a tropical depression probably by sometime tomorrow. Since Fausto is no threat to land and should be dissipating soon, this will be the last update.